This year's meeting in Weymouth was billed as even more informal than last year, and received very limited publicity, but nevertheless attracted some 20 folder enthusiasts. 5 of us travelled down together from Bristol on the 09.33 on the Friday morning, though Chris Dent and I opted to get out at Maiden Newton and ride from there, while Gary Lovell, Ray Racy and Steve Parry stayed on the train, arriving in good time to team up with Pat, Holly and Tom Strachan to meet Graham McDermott who arrived just after 1pm on a train from London. Other folders continued to arrive throughout the day, and a number of people also came just for the Saturday or Sunday. Chris and I had a very pleasant ride from Maiden Newton, although the rather misty conditions meant that we did not get the views that we hoped for. Much of the time at these events is spent in socializing (and, regrettably, scandalizing, led by Sir Benjamin), but of course we do fit in some rides as well, if conditions are suitable. Although it had been hazy for the ride on Friday afternoon, the conditions that day were fine apart from this, and Saturday dawned dry, clear and sunny. We gathered outside the Pavilion between 10.00 and 10.30 before leaving for our rides. 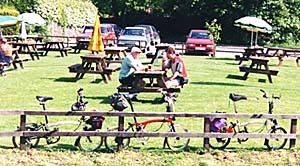 The main group went to The Wishing Well and various refreshment stops via Upwey before returning to Weymouth - a ride of about 17 miles. The six other riders took the more hilly route to Abbotsbury to visit the Swannery and other attractions. We all went round the Swannery, where there were plenty of nests and eggs, but we only saw one group of cygnets - things seemed less advanced than at this time last year. The group then split, with three riders continuing on a longer ride while the other three stayed at Abbotsbury to see some of the other sights before returning via an alternative route. The first part of the longer ride was rather spoilt by the continuous stream of motorcycles overtaking us - there was a rally in the area - and we also had to tackle a hill which was steep enough to reduce us all to walking. Once off the main road though conditions were perfect - hot sun, no wind and superb views, although we were again reduced to walking one long steep hill. By the time we returned to Weymouth we had done 54 Km, and I for one was suffering from seriously sun-burnt legs, this being only my third ride of the year on which it had seemed appropriate to expose the legs. 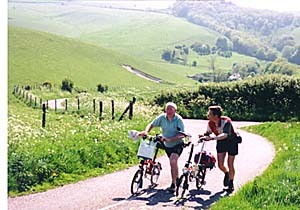 On the extended section of the Saturday ride to Abbotsbury, we were all reduced to pushing on two long, steep hills - here the two Chrises walk the final stage - I had already walked up the last third of the hill. Well earned refreshment later on the Saturday afternoon ride. Mist was setting in on Saturday afternoon and evening, and though no worse on the Sunday, was to detract somewhat from the enjoyment of our rides. Ur starting point and time was the same as on Saturday, but this time with everyone intending to ride over to Portland. The condition of the old railway track to the start of the causeway is currently appalling, and although everyone took this route on the way out, some riders regarded the road as preferable for the return, despite the traffic and hills. The majority opted not to ascend the steep hill in Portland, but some brave souls did make the ascent and go on to Portland Bill, as our group photograph proves. Just after the group broke up, Steve Parry arrived, so he should be added to the list of those making the longer ride. 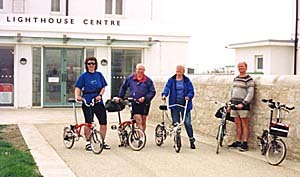 5 of the 6 riders who completed the ride to Portland Bill - Steve Parry arrived just after the picture was taken. Chris, Steve and I rode SPs, but all credit to Pat, who managed comfortably on a more standard Brompton, and Pauline and Carl who tackled this very hilly ride on a Bickerton and Raleigh Stowaway respectively. All my train journeys went very smoothly, more or less on time, and I was even able to get a seat on every train this time! I was also pleased to see on the return journey that the display screens at Bristol Temple Meads station are being replaced, and two at least were actually working, although the area where the timetables were located had been cordoned off so that it was impossible to read them. Naturally the corresponding displays at Birmingham New street were fully operational (well, on the return trip anyway) - pity there are still no lifts for use by the general public at New Street though. It was disappointing that none of the Henshaws were able to get to the event - David and Jane were busy with the next issue of A to B, and Peter was moving house. However, as my train pulled into Castle Cary on the way back, David, Jane and Alexander were on the platform (Jane and Alexander were catching a train going the other way, so I did have time to exchange a few words with them. The bikes were predominantly Bromptons, three being full SP versions and many of the others boasting at least some SP modifications. Steve's own model was highly unusual - the centre hinge had been eliminated (see additional pictures in Folding Society News issue 52), and the handlebar stem unplugs (like a Bike Friday) and clips alongside the front forks. 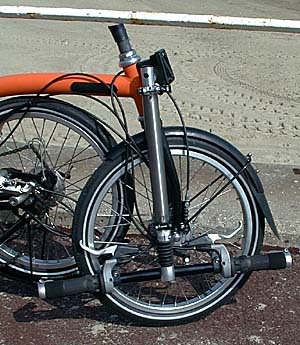 This makes an exceptionally thin package when 'folded', though longer than a normal folded Brompton. The idea is that use can be made of spaces such as the overhead racks in trains which are usually empty, even on very busy trains. Its an interesting idea, and of course executed to Steve's usual high standard, but lifting this or any other form of folder onto an overhead rack is not very appealing unless you are reasonably tall and strong. As the pictures on the web page version of FSN show, this prototype was finished in a rather striking orange colour, and the surface finish was also the texture of orange skin. 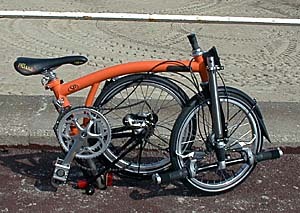 The fixed frame SP, showing how the plug-in bars are located after 'folding'. Other bikes present included three Moultons (one a New Series), a Birdy, a Bickerton and a Raleigh Stowaway. For those interested in such statistics, the vast majority of those attending travelled to Weymouth by train. Amongst the more unusual sights observed during our visit, but not part of our own event, were a man with a unicycle practicing juggling on the Promenade early on Sunday morning, and two girls with powered scooters seen on the Promenade on Saturday evening. 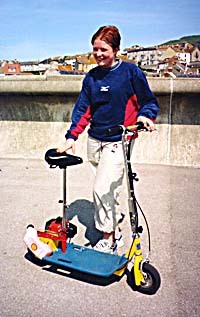 These scooters could loosely be classified as folders, as the bars fold down, but they were much more substantial and sophisticated than the unpowered one described in the latest A to B. Power comes from a two stroke petrol engine, and as standard speeds of 25-30mph are achievable. Tuned versions can apparently do 50mph. There is a front disc brake. 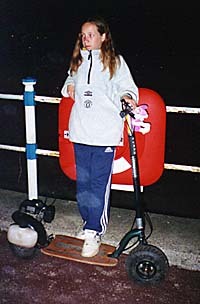 The children's parents reckoned that they can be legally used on the pavement as children's toys - I can't imagine any adult on such a device failing to attract the immediate attention of the Constabulary though. Another petrol-fuelled scooter was seen at lunchtime on Sunday on Portland. This too was being ridden by a girl, but was a less sophisticated, with caliper brakes, but it included a seat for the rider. The bars folded down and the seat post assembly could be removed. The owner reported having had encounters with the police, and was aware of the relevant rules and regulations. We should have a picture of this machine in the next issue of FSN. Unhappily we must conclude this report by extending our most sincere sympathy to David and Carol Harris who had to leave the event early following news of a bereavement.